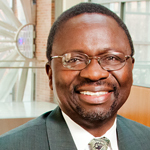 CHAMPAIGN, Ill. - Ilesanmi "Ade" Adesida, the dean of the College of Engineering at the University of Illinois at Urbana-Champaign, has been named vice chancellor for academic affairs and provost of the Urbana campus, pending approval of the board of trustees at its May 31 meeting in Chicago. He will assume his new role on Aug. 16. Adesida has served in various roles since becoming a U. of I. faculty member in 1987. Named dean in 2006, he also has been a director of the Center for Nanoscale Science and Technology since 2001. He will be assuming the post held by Richard Wheeler on an interim basis since January 2010. "Dean Adesida's global experience, expertise in innovation, and leadership in public and private partnerships has given him a solid foundation on which to build as he helps guide our campus forward," said Phyllis Wise, the chancellor of the Urbana campus and a university vice president. "He has an outstanding record of scholarship, a proven commitment to excellence, and an ability to successfully collaborate with colleagues at Illinois." Adesida and the other internal finalist for the position, Ruth Watkins, the dean of the College of Liberal Arts and Sciences, share vast experience and established connections, Wise said. Adesida will play a critical role in developing and executing the next steps in the Visioning Future Excellence initiative, which has challenged staff and faculty members to submit new ideas that will be used to plot the Urbana campus's course far into the future, Wise said. "Dean Adesida will be a critical asset for our campus as we seek to more aggressively advance our mission," Wise said. "I look forward to working with him as provost." Adesida, a Donald Biggar Willet Professor of Engineering, earned his undergraduate and doctoral degrees at the University of California, Berkeley. He served as a visiting assistant professor of electrical engineering at Cornell University in 1983, and was the head of the electrical engineering department at Abubakar Tafawa Balewa University, Nigeria, from 1985-87. Adesida has supervised many graduate and undergraduate students, and their research projects. He also is a member of the National Academy of Engineering, the chair of the National Science Foundation's engineering advisory committee, and a former chair of the American Society for Engineering Education's engineering deans' public policy committee. He has served on numerous committees for the Institute of Electrical and Electronics Engineers, and in 2009 received the Outstanding Alumnus Award from the department of electrical engineering and computer science at the University of California, Berkeley.